The nature of business transactions, as well as the products involved in them, is vastly revealed through SAP CRM Product Master. It is here that you’ll come across all the details pertaining to the product, customer accounts, warranties, etc. The master data includes some of the key areas, including product, information that is exchanged between different entities, and the BP number. The way Product Master works is the same across all processes that are involved in different CRM modules – Marketing, sales, and service. Different types of product supported include services, material, IP, financing, and warranties. Depending upon the role a user selects in the Product Master, the product types that can be maintained will be determined. The synchronization of CRM Product Master with ERP material master data is supported by SAP CRM. There is room for functionality in SAP CRM and this helps in building a relationship between products. There is a provision for product structuring through SAP CRM. 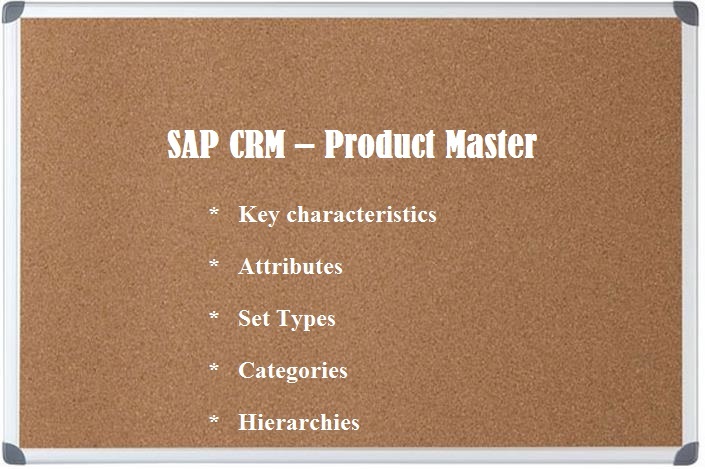 For this, the SAP CRM uses hierarchies and categories that are provided to you via Product Master. SAP CRM system comprises of three different predefined hierarchies – R3PRODSTYP, R3PRODHIER, and R3MATCLASS. Custom categories can also be created within the Product Master as per your business requirements. Categories can be formed in the form of a tree such that one category falls within another category and so on. There is also an option to include Set Types within the categories to facilitate maintenance of properties. Set Type that will be defined within a hierarchy can be assigned to multiple categories. However, the Set Types have to be defined only within a single hierarchy. An attribute constitutes – attribute length, attribute type, and range value. Therefore, a Set Type can be defined as a collection of attributes. A Set Type can, therefore, be attached to a hierarchy and a category within the Product Master. Product Master can be integrated with CRM Web UI in SAP CRM. Therefore, depending on how you decide to use the CRM application, you can do a lot of functions with CRM Web UI, including creating, modifying, and deleting for Product Master. You can see all the product details or the general data pertaining to them in the Product Details assignment block. This would typically include Base Category, the status of the product, a checkbox to indicate whether the product is configurable or not, and the base unit of the product. Hierarchies and categories can also be maintained within the CRM Web UI. For example, under ‘Hierarchy Details’ block, the details related to hierarchy can be entered. Similarly, under ‘Category’ block, you can see the categories that have been mentioned with a hierarchy. Under ‘Assigned Set Types’, you can assign Set Types. SAP CRM Product Master also gives you the option to record product information of your competitors. All these details are entered on the Competitor Product page.